Last autumn when the soil was wet, harvest equipment left ruts behind, leaving producers with rough terrain to tackle. Producers need to evaluate soil moisture conditions as spring rolls on. Learn more. Ahead of planting season, experts from the K-State Research and Extension have provided an update on spring soil temperature and moisture conditions. Learn more. Experts recently shared insights regarding flooding in Iowa, western Illinois, and eastern Nebraska. Learn more about the impact of this flooding and how to handle flooded soils. 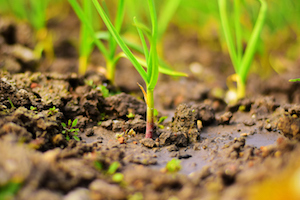 Spring has officially sprung, meaning the Iowa State University Extension and Outreach is offering tips for spring planting and wet soil management. Learn more. John Deere has announced the development of a new attractions passport program, designed to give guests a way to log destinations they have visited. For more information go to www.VisitJohnDeere.com. March 14, 2019 marks this year’s celebration of National Ag Day. To learn more about this event, visit agday.org or contact the Agricultural Council of America for more information. Nebraska Crop Improvement Association is encouraging growers to check the germination rate for their soybean seed, as many are falling below the normal rate. Learn more. John Deere has announced that it will be participating at the Iowa Power Farming Show from January 29-31 in Des Moines, Iowa. If you plan to attend the event, look out for booth #2038. John Deere has been recognized for its innovations with six AE50 awards, highlighting its continuous dedication to excellence in its field. John Deere is participating in CES® 2019, which is being hosted in Las Vegas, Nevada. This event is set to unveil technologies that revolutionize the way we live, work, and play. University of Missouri Extension climatologist, Pat Guinan, recently reflected on the weather patterns of the past year and looked back on how the temperatures and rainfall affected crops and producers. Experts from the Iowa State University Extension and Outreach have decided to take a closer look at the impact of rains over this past season as a result of a late soybean harvest. UK researchers have come together to determine the best way to seed cover crops into double-crop soybeans. For more information on this study, contact Edwin Ritchey. Experts at the Kansas State University Research and Extension discuss the narrow window for planting winter canola in fall 2018, starting with September rains and ending with heavy rains in October. At the end of the harvest season, producers should begin to consider their tillage options, according to experts at the Iowa State Extension and Outreach. For more information, visit https://crops.extension.iastate.edu. John Deere has announced that it is updating its E-Series Knuckleboom Loaders. For more information about the 337E, 437E, or any other Deere forestry machines, visit a local John Deere or www.johndeere.com. John Deere has announced the expansion of its lineup of mowers with the new diesel Z994R Commercial ZTrak zero-turn mower. For more info, contact your local John Deere dealer or visit www.JohnDeere.com.